BETWEEN: Hooroo Pty Ltd. ABN 32 152 774 457 of 10 Bourke Road, MASCOT, NSW, 2020 Australia (‘Qantas’, ‘we’ or ‘us’) AND (company name) (company number) of (registered address) (‘you’). A. We are the provider of the System that enables accommodation providers like you to sell access to your rooms (and other related items) on a commission basis through the Website. B. You agree to supply, and we agree to distribute, accommodation and other related items on the terms of this Agreement. ‘Booking’ means the contract that forms when a Customer has accepted an Offer and paid the Booking Price. The Booking Price does not include any fees or surcharges that we may charge the Customer. Booking Price will be payable in the local currency of the hotel booked. ‘Chargeback’ means the rejection or failure of or challenge by a bank or financial institution (card issuer, acquirer or our bank) to a payment received by us from a Customer. ‘Commencement Date’ means the date you sign this Agreement. · the Booking Price; or · the non-refundable portion of the Booking Price as applicable, and is exclusive of GST. ‘Customer’ means a customer who visits the Website to look for accommodation venues or makes Bookings. ‘Damages’ means liabilities, expenses, losses, damages and costs (including legal costs on a full indemnity basis and whether incurred by or awarded against a party). ‘GST’ means any goods and services tax imposed by legislation enacted by the Commonwealth of Australia including a tax imposed by the A New Tax System (Goods and Services Tax) Act 1999 (Cth) and the related imposition Acts of the Commonwealth or equivalent tax to be paid in the respective jurisdictions under relevant applicable laws of that country. ‘GST Rate’ means the rate of GST expressed as a percentage. ‘IPR’ means all intellectual property rights in New Zealand, Australia and throughout the world. ‘Offer’ means the details of the accommodation offers that you have loaded on to the System and that we can make available to Customers on your behalf for Bookings, and includes, but may not be limited to the room type, availability, Booking Price, inclusions, restrictions, policies, terms and conditions and any other information you provide. ‘Personnel’ means employees, officers, agents and contractors. ‘Property’ means the accommodation venue(s) that you want us to accept Bookings for under this Agreement. ‘Property Details’ means details of the Property or Properties made available by you including, but not limited to the Property’s features, amenities, images, room types and all Offers. ‘Qantas Group’ means us, Qantas Airways Limited (ABN16 009 661 901) and any related body corporate (as defined in the Corporations Act 2001 (Cth)) or any related company (as defined in section 2(3) of the Companies Act 1993 (NZ), and read as if the expression "company" in that subsection included any body corporate of any jurisdiction), and a ‘Qantas Group Company’ means any company in the Qantas Group. ‘Rate’ means the rate for each Offer as determined by you from time to time and communicated to us via the System. The Rate is net of Commission and inclusive of GST and other taxes payable by you. The Rate will be loaded in the local currency of the hotel. ‘System’ means the Property Management System that is provided to you to load your Property Details. ‘Website’ means Qantas.com, Jetstar.com, Hooroo.com and any other Qantas Group website as notified to you from time to time. 2.1 We will provide you with access to the System on the terms of this Agreement. 2.2 We will provide you with a username and password to access the System. You must take all necessary steps to protect the confidentiality of your password. You are responsible for any action taken by any person accessing the System with your password. 2.3 By loading the Property Details on to the System, you agree that we can display that information on the Website and accept Bookings on your behalf from Customers. 2.4 You are solely responsible for ensuring the completeness, reliability and accuracy of all Offers and any other information regarding your Property held on the System and you must ensure that such information is not misleading or deceptive in any way (eg you must disclose details of any circumstances that materially reduce the amenity of the Property during a particular period, such as construction works). You indemnify us against all costs (including fines or penalties) whether incurred by or imposed on you or us due to a breach of this clause by you. 2.5 The Offers you load will be no less favourable to those made available by you to consumers directly, or through other distribution channels including any special offers, promotional rates and restricted rates. 2.7 We can alter, amend or deactivate the System at any time and for any reason whatsoever, including by deleting or removing any information or Offers contained on the System. 2.8 We make no representation and give no warranty as to the functionality, availability, use, operation or any other aspect of the System or the Website. 2.9 You will conduct yourself and ensure that any Offers you load onto the System are managed and operated in a manner consistent with all applicable laws. You warrant that you hold all necessary licences, permits, authorities and consents necessary to fulfil the Bookings. You must also ensure that the Property is safe, well maintained, has proper emergency egress and that your Personnel are trained in emergency procedures. 3.1 We will accept Bookings via the Website, for which we will earn the Commission. 3.2 We will notify you of every Booking made via the Website by email or any other agreed method of confirmation. 3.3 In respect of all Bookings, the contract of supply is between the Customer and you, not us. You will supply and fulfil all elements of the Booking to the Customer, as confirmed to you by us. 3.4 We will issue tax invoices and adjustment notes to the Customer on your behalf in respect of all Bookings and you will not issue tax invoices and adjustment notes in respect of the Bookings. (b) travel costs to and from such alternative service, at no charge. If the Customer rejects your offer, you authorise us to provide a full refund of the Booking Price to the Customer. You must also pay any compensation to which each Customer is entitled (whether from you or from us) under any applicable consumer protection laws and regulations. You agree that we may include these terms in any Offer you place on the System. The rights and obligations under this clause do not limit or affect our rights against you elsewhere under this Agreement. 3.6 You must not, directly or indirectly, use Personal Information collected through a Booking except to the extent necessary to satisfy that Booking. 3.7 You agree that we may hold any money we receive from a Customer in relation to a Booking in any account we choose and we may utilise those funds as our own. 3.8 In relation to each Booking, we will remit to you the Booking Price in the local currency of the hotel less our Commission (together with GST on the Commission) on or before the 15th day of the month following a Customer’s check-in. If a Customer cancels a Booking, we will refund the Booking Price to the Customer, less any non-refundable portion of the Booking Price in accordance with the terms of the Offer and any applicable laws. We will remit that non-refundable portion of the Booking Price to you, less our Commission (together with the GST on the Commission), on or before the 15th day of the month following that cancellation. 3.9 You are responsible for calculating, reporting and paying any applicable taxes, including but not limited to, GST on all Bookings to the applicable tax authorities. You shall pay or reimburse us for and indemnify us against all taxes, charges, fees and other imposts of whatever kind (including any fine or penalty imposed in connection therewith) levied, assessed, charged or collected in connection with this Agreement (including payments made under this Agreement) or the services performed pursuant to this Agreement. You shall provide us with your GST registration number, where required. 3.10 In respect of any remittance amount payable to you, we will issue you a remittance advice detailing the Booking and a tax invoice for the amount of the Commission and the GST on the Commission. Any remittance will be paid by a payment mechanism determined by us, which may include electronic funds transfer or virtual credit card. 3.11 You must retain evidence of the Customer’s stay (which could include a hotel registration card with driver's licence number, passport number or some other officially recognised identification) for each Booking following their check-in. You must ensure that the name of the guest checking-in and the name of the Customer of the Booking match and must provide the evidence of stay on request by us. In the event of any Chargeback arising from a Customer disputing a Booking transaction, your failure to provide sufficient evidence to us and the relevant bank or financial institution will result in us adjusting or reversing payment to you in regard to that Booking. 3.12 You are solely responsible for the payment of any applicable taxes on the amounts remitted to you by us, including, but not limited to, GST. 3.13 We have the right to offset any payments owed by you to us against amounts owed by us to you. (c) take steps that may or do divert internet traffic from the Website to any other website, whether controlled by you or not. 4.2 You confirm that you own or have the right to use all material you place on the System. You also grant to us a worldwide, perpetual, royalty free licence to use that material, including the Property Details in any manner we see fit for the distribution or promotion of your Offers on the terms set out in this Agreement. 5.1 Either party may terminate this Agreement immediately at any time by notice in writing. 5.2 Termination of this Agreement will not affect the accrued rights or remedies of either party. 5.3 After termination, the confidentiality, indemnity and insurance provisions of this Agreement will continue. Despite any termination of this Agreement, you must provide the accommodation or other valuable service required by any Booking made prior to the termination of the Agreement on the terms set out in this Agreement. 5.4 Following termination of this Agreement, we will remove all Property Details from the System. (g) negligence or default by you or your Personnel. 6.2 If you subcontract any part of your obligations under this Agreement or source products or services from a third party, you must ensure that the subcontractor or third party supplier complies with your obligations, including but not limited to those relating to indemnity. 6.3 You must take out and maintain public and product liability insurance covering you, us and any Customer using the Property for not less than $5 million per occurrence. 7.1 Governing Law: This Agreement is governed by the laws applicable in the State of New South Wales and each party submits to the exclusive jurisdiction of the courts of that State. 7.2 Waiver: A right may only be waived in writing, signed by the party waiving the right. 7.3 Assignment: We may assign the benefits under this Agreement or novate the entire Agreement to any member of the Qantas Group. You must not assign or attempt to assign or otherwise transfer any right or obligation arising out of this Agreement without our prior written consent. 7.4 Amendment: We may amend this Agreement from time to time, by notice to you. Any changes will be effective upon posting a modified version on the System, and your continued use of the System following such amendment will constitute your acceptance. 7.5 Authority: By signing this Agreement, you warrant that you are legally authorized to enter into this Agreement and to take action under its terms in respect of the Property. 7.6 Notices: A notice under this Agreement may be sent by prepaid post, fax or email to the party’s address set out at the start of this Agreement. 7.7 Translation: This Agreement is in English. Upon request, we may provide you with a translation of this Agreement into a language other than English (“Translation”) as a guide only. For the sake of clarity, a Translation is provided without any warranty as to the accuracy of the translation from English, and you warrant that you have taken your own advice regarding entering into this Agreement with us. You acknowledge and understand that in the case of any inconsistency between this Agreement and a Translation, this Agreement takes precedence and the Translation has no binding effect. I agree to the terms and conditions contained in the Hotel Supplier Agreement. * Company name Pty Ltd. 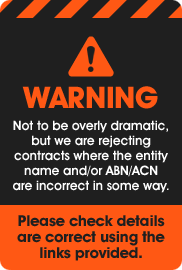 Note: This must be a legal entity, not a trading name or the name of a trust. * Company name Pty Ltd. Note: This must be a legal entity that is the trustee, not a trading name or the name of the trust. * Name Note: This should be the hotel name or trading name. On submit a copy will be emailed to you for your records.